← Peter J. Trares – 1st photo of a Trares ancestor! Joseph Kline, 64, of 410 King St., Ravenna, died at Robinson Memorial Hospital at 4:55 p.m. Monday after a long illness. 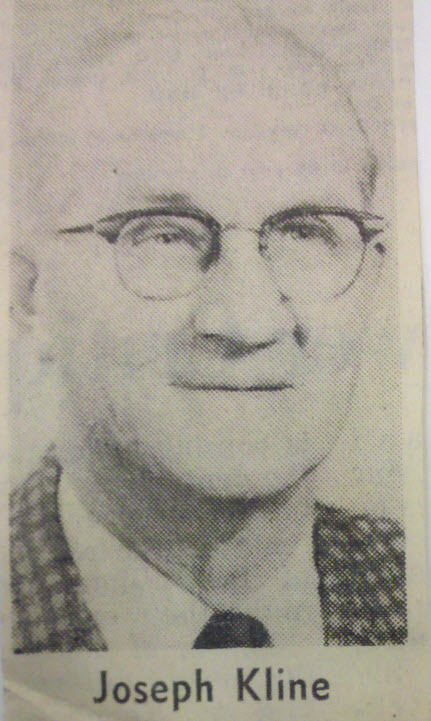 Born in Rootstown, June 14, 1897, he had lived in Portage County his entire life and the last 39 years in Ravenna. Until his illness, Mr. Kline was a truck driver for the Portage County Highway Department. He was a member of Immaculate Conception Church, Ravenna Lodge 1234, Loyal Order of Moose, and Ravenna Aerie 2164, Fraternal Order of Eagles. Surviving are three daughters, Mrs. William Kline (Barbara) of Rootstown, Mrs. Robert Starkey (Rita) of Brady Lake, and Linda Kline of Kent; eight sons, Sylvan and William, both of Kent, Robert of Rootstown, James of Houston, Texas, Vernon of Shalersville, Kenneth, Joseph, and Gerald, all at home; a sister, Mrs. John Knapp, of Kent, two brothers, Ervin of Bucyrus, and Gus of Rootstown; and several grandchildren. Mr. Kline’s wife, Helen, died in 1951, and a sister, Mrs. Grace Gray, of Ravenna, died on May 29, shortly before his last admission to the hospital. Requiem mass will be held at 10:00 a.m. Thursday at the Immaculate Conception Church. Burial will be in St. Mary’s Cemetery. Friends may call at the Wood Funeral Home, Ravenna, anytime after 2:30 p.m. Wednesday. If anyone knows the maiden name of Joseph Kline’s wife, I would appreciate it if you could drop us a line here at Knapp Notes. I don’t have that information – yet. I have also located a copy of the Joseph Kline’s WWI draft registration. You can click on the thumbnail image below to see a larger version of this document. 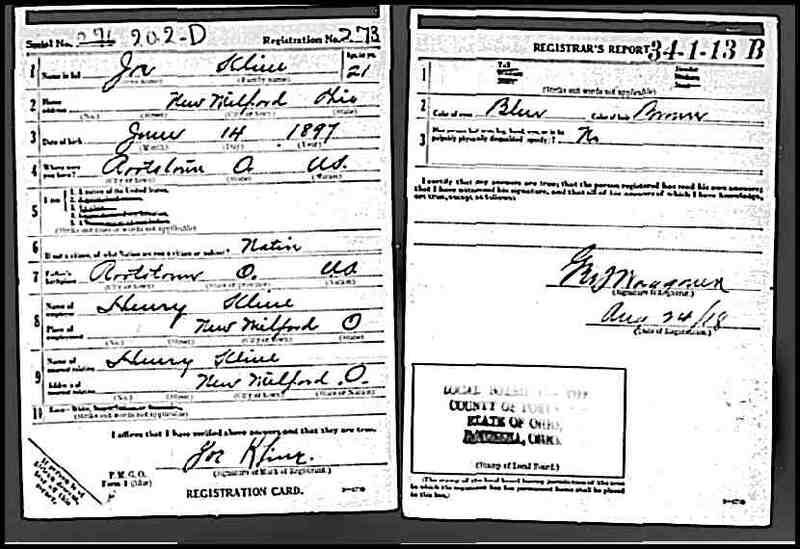 This entry was posted in Draft Registration Cards, Family History, Kline/Cline/Klein, Obituaries and tagged Grace Kline, Joseph Kline. Bookmark the permalink.